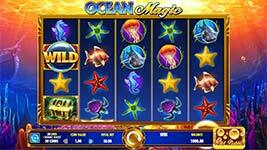 Relax and have a good time as big prizes wash across the sea in Ocean Magic slot machine by IGT. This gorgeous new release features 5-reels, 4-rows and 50-paylines of slots action. Sail to winnings with bonus features that include the Wild Bubble Feature, Bubble Boost Feature, Pick Feature and a Free Spins Bonus round. Wild Bubble Feature – One or more bubbles may appear randomly below each reel and move up one position during a reel spin. When the reels stop, the bubble lands on a symbol turning the symbol in that position wild. If a bubble lands on an Ocean Magic symbol, the Wild symbol appears on all adjacent symbols. When a bubble expands in this way, only the original bubble moves upward during the next spin. Bubbles disappear when they move past the top row. If a bubble lands on a Bonus symbol, it become wild and keeps its bonus trigger functionality. Bubble Boost Feature – Press the Wild Bubble button to activate the Bubble Boost feature. When the Bubble Boost feature is activated, up to 7 extra bubbles appear from the Golden Horn and move to random positions on the reels. Bubble Boost bubbles function in exactly the same way as Wild Bubbles. Bubbles generated from the Golden Horn do not land on the top position of a reel, the bottom position of a reel, or on any reel position in which a bubble already exists. Bubble Boost feature is only available for real money play. Pick Feature – The Pick feature is triggered when 3 or more Bonus scatter symbols appear anywhere on the reels. Select floating bubbles to reveal 2 to 3 extra picks, or 1 to 5 additional free spins. The Pick feature can be retriggered up to 4 times per bonus. The maximum number of extra pick bubbles available during the Pick feature is 5. The total number of possible picks during the Pick feature is 35. Free Spins Bonus – The Free Spins Bonus begins after the final bubble is selected during the Pick feature. At the start of the bonus, two bubbles appear, one beneath reel 1 and one beneath reel 5. The Free Spins Bonus is retriggered when three or more Bonus scatter symbols appear anywhere on the reels. Retriggering the Free Spins Bonus awards an additional Pick feature. If enabled in the base game, the Bubble Boost feature also enabled during the Free Spins Bonus. The Free Spins Bonus can be retriggered up to 4 times per bonus. The bonus can be retriggered multiple times, up to a maximum of 750 free spins per bonus. Free spins are played at the same coin value as the triggering spin.